Nana’s Pacific Crest Trail Adventure – Week One! Local Truckee -Tahoe resident, Nana Langton is thru-hiking the Pacific Crest Trail this year. 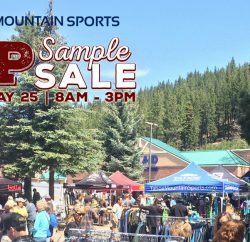 Tahoe Mountain Sports is a proud sponsor of her efforts! Zigzagging its way from Mexico to Canada through California, Oregon and Washington the Pacific Crest Trail (PCT) boasts the greatest elevation changes of any of America’s National Scenic Trails, allowing it to pass through six out of seven of North America’s ecozones including high and low desert, old-growth forest and arctic-alpine country. 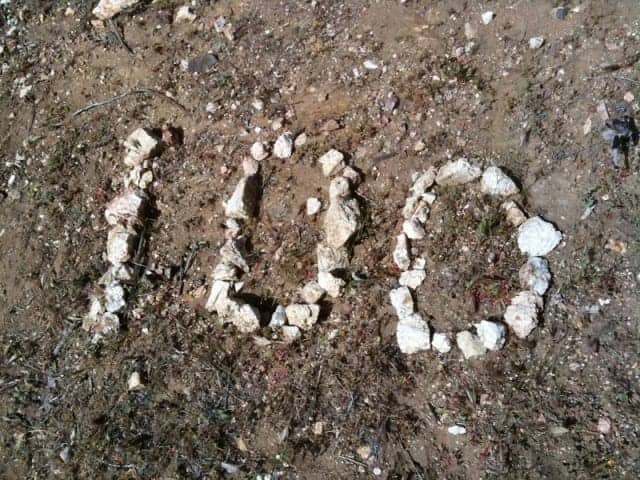 Approximately 2650 miles in length, the PCT is a trail of diversity and extremes. 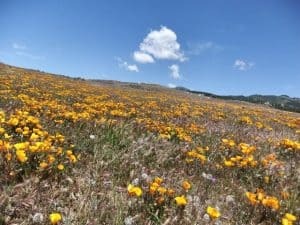 From scorching desert valleys in Southern California to rain forests in the Pacific Northwest, the PCT offers hikers a unique, varied experience. 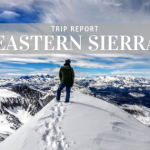 Here is her report from the first week on the trail. On the last weekend in April, I found myself at the Lake Morena County Park in Eastern San Diego County at an event called ADZPCTKO! What in the world is that you ask? 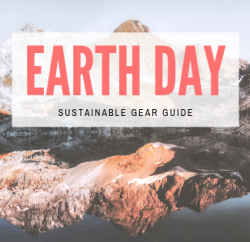 How about the “Annual Day Zero Pacific Crest Trail Kick Off.” This yearly event marks the traditional start of the hiking season for folks tackling the PCT from South to North. 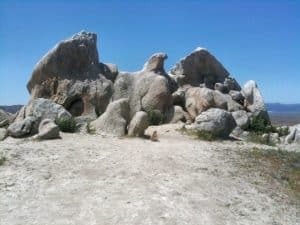 Around 650 participants from around the globe found their way to this remote park, 20 miles north of the Mexican Border near the small town of Campo, California. 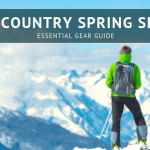 This event attracts hikers, past present and future to share stories of the trail and view the latest in ultra-light backpacking gear. The event also features officials from the Pacific Crest Trail Association, the United States Forest Service and even the postal service who open a temporary post office on site so that hikers can mail gear and food to spots ahead on the trail and also to send home the gear they just realized was way too heavy! So, early Sunday morning, the 25th of April, I set out across the desert of southern California on my way to Canada. 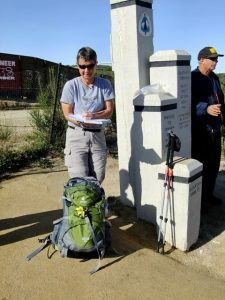 That first day I hiked 20.5 miles, back to the campground at Lake Morena where a great meal of BBQ’ed chicken, baked potatoes and salad was waiting, prepared by my husband, Bill and friends. It was a great start for this adventure of a lifetime. On the morning of day two, I again took off northbound towards my destination for the evening, Mt, Laguna, some 23 miles distant and at an elevation of 6000 feet. I soon crossed under Interstate 8 and headed uphill. We in the hiking community call days like this “Major UFH”. I’m sure you can figure it out but basically it means that there is a lot of uphill tread. The scenery went from cactus and rattle snakes to alpine with snow and pines, much like what I am used to here in the Lake Tahoe area. It got noticeably cooler as I headed uphill too! Upon my arrival, I found that my husband and friends had secured lodging at the historic Mt. Laguna Lodge. Were we supposed to be camping again tonight but our spot was covered with standing water and snow. So – I guess a nice bed and a warm shower would have to do. Tuesday morning, I bid farewell to Bill as he had to head back home and get back to work. I headed out shortly thereafter enjoying a beautiful mountain morning. Unfortunately, a little later in the day, the winds started to pick up and the clouds started rolling in. The forecast was for a storm to hit that evening. I set up camp to cloudy skies and howling winds. Sure enough, by morning, it was pouring rain and spitting snow and the winds were driving it all sideways past my tent flap. I retreated to a nearby campground bathroom and packed up my gear, enjoying the dry space for a quick bite of breakfast. That day, I was hammered on the trail with winds and rain. It was a miserable day but I trudged ahead, only making 7 miles on the trail. As I came around the bend, I found myself approaching another campground. The place was closed and deserted but I spied some bathrooms and thought I would seek some shelter from the weather. I tried the door and happily found that it was unlocked. 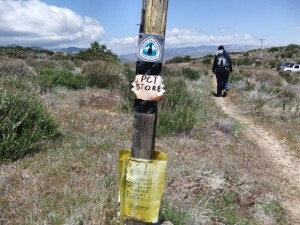 Imagine my surprise when I found it was full of other PCT hikers who had the same idea! We all laughed at our fortune and I learned that a ride to the nearby town of Julian had been arranged. We all gratefully headed into town and a dry place to sleep for the night. Thursday morning, I got a ride from friends back to the trail and I started out from where I had left off. Today was much nicer and the miles went by much easier. My destination for the day was a spot called Scissors Crossing, some 17.5 miles distant. The cactus flowers were everywhere and the scenery quite beautiful. 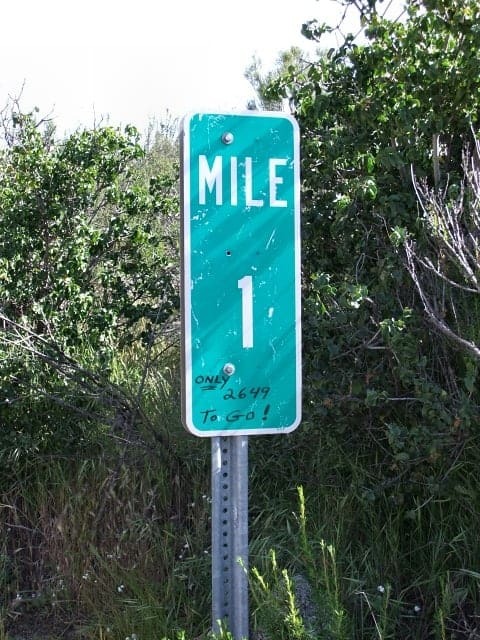 In the middle of no-where, I came across my first instance of what we call “Trail Magic”. 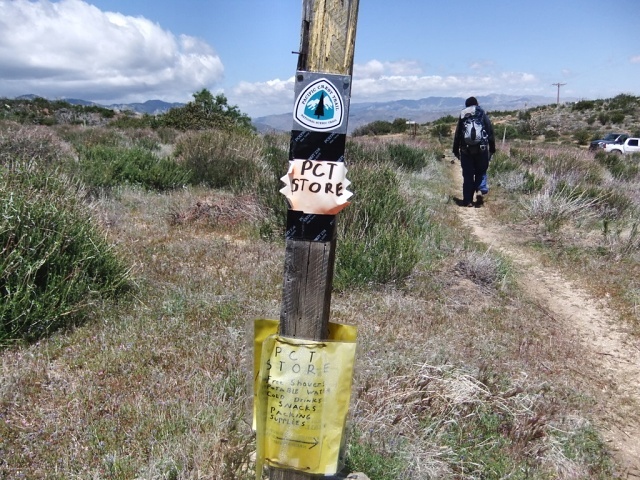 Some intrepid “Trail Angels” – people who give back to the hiking community, had set up a hiker store next to the trail. They were offering gear, food, water and showers to the hikers out of a trailer. A nice candy bar hit the spot just right. Soon Scissors Crossing was in sight as I set up camp for the night. Friday was a big day and my longest on the trail so far at 24 miles. My destination was another spot in the middle of no-where called Barrel Springs. I knew there should be a water cache there, placed by trail angels who stocked it in the early season for the “thru’s” headed north. It was quite a bit warmer although still beautiful. I am starting to get used to my Deuter ACT Lite 60+10 SL pack and it’s customized hydration system. Dave at TMS has also provided me with products from Platypus, including their newest model bottle with the dual-valve, HyperFlow cap. Both of these are providing me with plenty of water capacity and the mouthpiece valves on both systems are working very well! 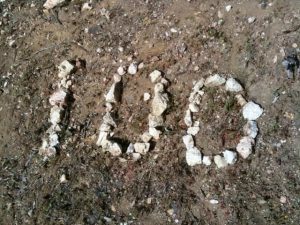 Near the end of the day, I came across the 100 mile marker – a welcome sight along the trail! Saturday, I had an easy 8 miles to my weekend destination, the Warner Springs Ranch Resort. Here in the middle of the desert is a wonderful golf course, hot springs resort with all kinds of wonderful amenities. I was treated to beautiful displays of wildflowers as I neared my destination! Another interesting vista I encountered was an outcropping called Eagle Rock. One look at the photo below and you will instantly recognize how this formation received its name! Finally Warner Springs came into view and I hit the pool and restaurant to relax. 110 Miles down, only 2540 to go! Sunday would be my first “Zero Day” – a day with no mileage planned. Stay tuned for more updates from the trail. In the next two weeks, I hope to hike another 158 miles to the community of Big Bear where I will celebrate my 25th wedding anniversary with Bill and my 49th birthday!